Only a tool designed for the needs it is used for can ensure an easy and successful accomplishment of a complex task. 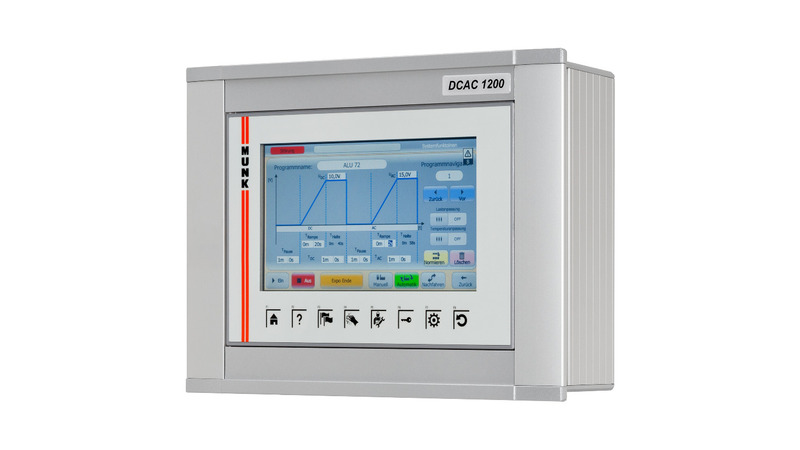 The DCAC 1200 is designed to successfully operate the electrolytic colouring process of aluminium. The layout of the DCAC 1200 reflects our process-driven design. Owing to its compact size and sealed control panel, the power supply can be placed close to the process tank to ensure highest efficiency and monitor the process for obtaining a more consistent quality. The applied power conversion technology of the DCAC 1200 is another key factor of the success of the DCAC colouring power supplies supplied by us for the last three decades. By means of a digital control circuit, the sine wave AC power signal is continuously monitored to achieve high colour con-sistency and short process times at the same time. For further improving the operating efficiency of our colouring power supply, we continuously optimize all power components. The clearly structured HMI design, the optimized and conditioned power signal combined with our design concept ensure high productivity, high colour consistency and successful operation for years.